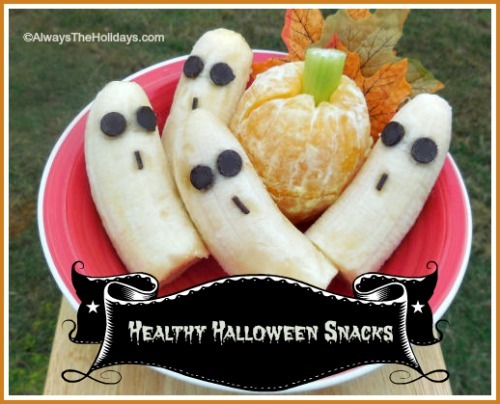 These banana ghosts and orange pumpkins will have your kids squealing with delight, while making sure they get the nutrition from healthy food instead of sugary calories. There is so much in the way of sugary snacking going on this time of the year. Why not feed your children something much more healthy? These fun snacks are super easy to make. They can be done in a flash when your child is asking for an afternoon snack and you want them to have something that isn’t full of sugar or sodium. Just cut the banana in half and decorate into a ghost with chocolate chips for eyes and sprinkles for a mouth. The pumpkin is make with a small piece of celery to act as a stem. Tangerines could also be used for a smaller pumpkin. That’s all there is to it! A healthy snack in no time at all that your kids will love. Place a one inch piece of celery into the opening at the top of the orange. Add the chocolate chips on the banana top to make ghost eyes and one sprinkle for the surprised mouth.